Places do matter. They are different from each other. People in those places are different and the thoughts and experiences you can have in one place bear no resemblance to the thoughts and experiences you can have in another place. I assert this only because there are people in my world who believe that place doesn’t matter, that we carry ourselves and our nightmarish inner realities with us wherever we go, and so it doesn’t really matter where we are, we must fight our spiritual battles out to the death on an interior plain, regardless of the location of that plain. For me, some places are so much themselves that I am different when I am there; the thing that is my “self” bends and changes in those places. The scabs and scars that are myself, the wounds of the past, fall off, leaving something much softer and much smoother, more receptive, more alive. New York City is one of those places for me. When I was just moving out of childhood into adolescence, my father’s employment at the University of the South at Sewanee (now being rebranded only “Sewanee” to try to drop the Southern associations) got too hot for him. His bishop-boss, one Bishop Frank Juhan, informed him that he needed to stop working with the local priest for racial integration of our Episcopal parish and public school or else. I don’t know whether the “else” was specified, but Dad was never slow to take that kind of hint. So my father, Arthur Ben Chitty, plucked himself out of the little pond that was our world back then in 1965 and got a job in New York City, the biggest pond in the world at that time. By 1966, my father and mother and my younger brother and I were plopped into an apartment (7B) at 360 W. 22nd Street, which at the time was unfashionable Chelsea, now very fashionable Chelsea, on the lower West Side of Manhattan. Our apartment was probably 900 square feet, I’m thinking–actually a 3-bedroom apartment. I was the most unhappy and resistant to the move, so my parents gave me the biggest bedroom, facing the back of the building and a little open space outside; my brother was dumped in a dark little room facing on 9th Avenue and had to sleep in a bed that unfolded from a green upholstered chair. My parents themselves had a folding double bed inside a sofa, dreadfully uncomfortable. I had two proper beds and a TV, over which my brother and I squabbled constantly. I was not the nicest child in the world; in fact, I was possibly the most selfish and nasty kid in our whole extended family. 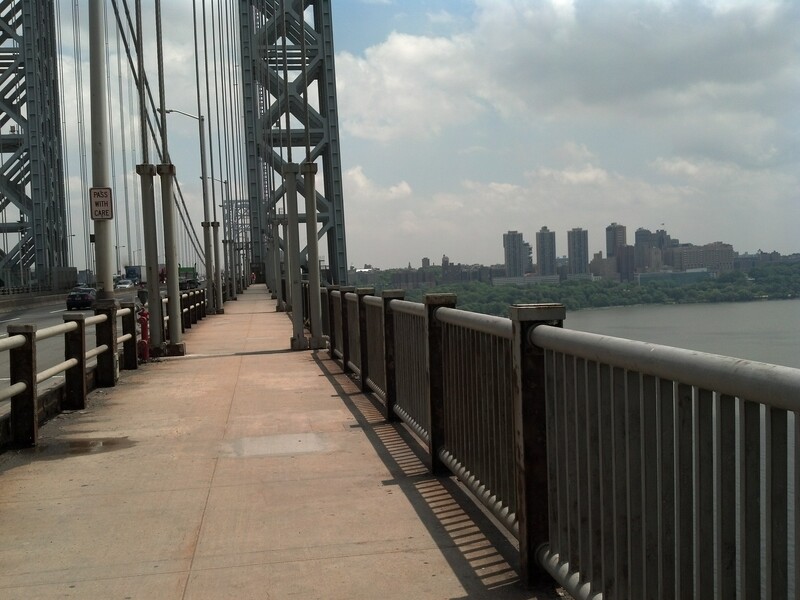 On this coolish day in June, I directed my bicycle over the George Washington Bridge to go visit the gift that Manhattan had been for me long ago. Wonderful. I’ve been missing these posts, so glad you were able to share some more of your adventure. Fascinating what is coming up as you write. Thank you. Glad that NY was such a place for you. If a place can be good, can a place also be “bad”? Have you ever descended a hill into a place and just felt a heaviness… a place that was written about in a song… that you would never leave ______ alive. There are few that are able to maintain a positive attitude in such an area. There are opportunities in such an area… to learn that one must depend on a strength greater than one’s own. And, perhaps, that is a crucial lesson to learn in this life. Yes; actually I feel that way about Knoxville and have for some 28 years. It has not been a lucky place for me: two bad marriages, many years of underemployment, some outright poverty, and often a sense of isolation.